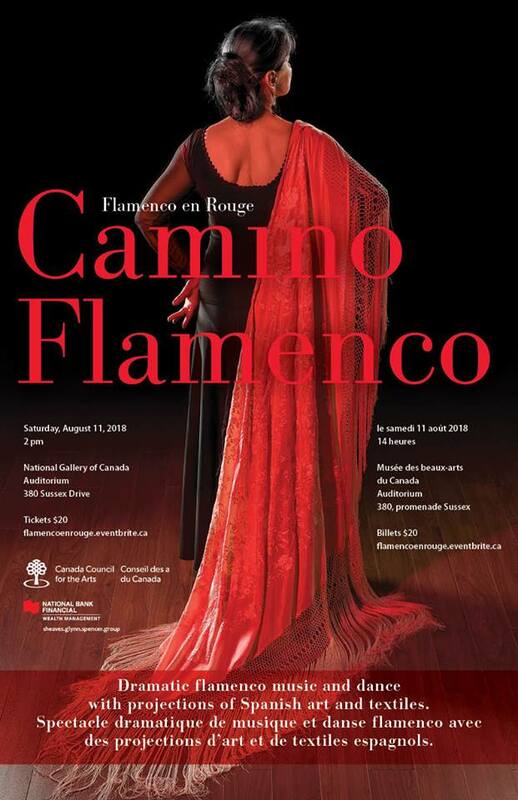 On August 11, 2018, The National Gallery/Musée des beaux arts, Ottawa, will host, Camino Flamenco, performed by Flamenco en Rouge in collaboration with artists David Howard and Robin Muller. Camino Flamenco is a dramatic multimedia production on the theme of journey. Passionate and virtuosic flamenco music and dance will be framed by projections of Spanish art, and specially produced textiles. This event promises an unforgettable evening for those fortunate to be in Ottawa on August 11th. Flamenco en Rouge is a Flamenco group of eight musicians, singers and dancers committed to the pure, authentic beauty of the art form, delivered through intensely original creations. Martine Durier-Copp, Director, Centre for Executive and Graduate Education, is a principal Flamenco dancer and Flamenco en Rouge’s Artistic Director. Martine’s choreography flare comes from her focused dedication and years of training in Spain. She delivers an authentic, highly emotional Jerez-style gypsy flamenco. In a recent telephone interview with CEGE Connection, Martine shared her insights on the upcoming performance. El Camino means “the way” and “journey” and signifies the undertaking of a transformative voyage. Flamenco has been my own personal journey of discovery and creativity. Flamenco, a UNESCO world heritage treasure, is not “codified” into a body of knowledge that can be transmitted through traditional teaching methods – it is primarily transmitted through an oral tradition, involving studying with recognized masters in Spain. Understanding and dancing according to established structures, and improvising, are key components of gitano (gypsy) flamenco, achieved within “palos” that are established frameworks and communication patterns among musicians, dancers and singers. Flamenco speaks to universal themes of struggle, search for meaning and identify, and embracing of life, with its many vicissitudes. The emotionality of flamenco, and the powerful feelings that it conjures, are felt by audiences around the world. For me, it is a highly spiritual undertaking, wherein those feelings are sublimated through their expression, and through communication with the audience. We all emerge transformed by the experience! I was recently honored to receive a Canada Council grant for my dance, which was most humbling, as a peer-reviewed recognition, and, at the same time, very motivating! I look forward to sharing the outcomes of this exciting project in future CEGE Connection posts.